What an AMAZING day! We all met as a team for breakfast, had a quick meeting and then headed to our bus at 8:30am. The drive to the village was about 45 minutes and it almost felt like home with the water near by and the red soil everywhere...a very vibrant colour of red. We arrived at the village and were met by a beautiful welcoming ceremony. First the Director of REAL welcomed us to the village, Mr. Charly did some introductions and then all the women in the woman's organization at the village, their children and some of the men were there to great us. Three women came around with a dish that they had lit on fire and placed it in front of us. 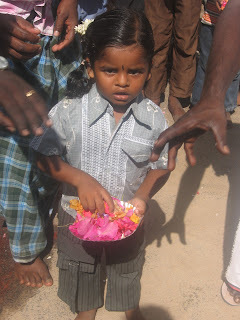 Then we were greated with these beautiful flower lays and then the young children came forward and threw flower petals towards us...the littlelest of them started to come forward and when she almost reached me got scared and started to cry....she was so beautiful. What an overwhleming experience. The people of the village completely opened their arms and welcomed us in. From here we took a walk down through part of the village. Lots of cattle, dogs, chickens, goats, sheep and a variety of houses from well constructed to barely standing. 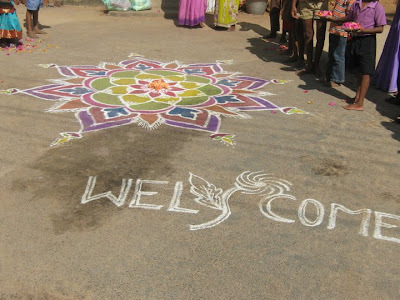 We then went to our tented area where we all sat down and some more welcomes and short speaches were made.....lots of translating going on as the villagers speak Hindu. It was quite amazing to see these people looking at us in bewilderment and us looking back at them in awe. There were lots of pictures being taken from both sides, lots of staring and smiles. By 11:00am we had our break....you need lots of liquids and food to give you energy and we were sweating buckets already...our safety orientation was complete and we were then shown by our foreman what he wanted us to do. Since this was a pre-build, we were preparing the land for the foundation, so this involved digging holes 4 feet wide, by 4 feet long, by 5 feet deep...six for each house. 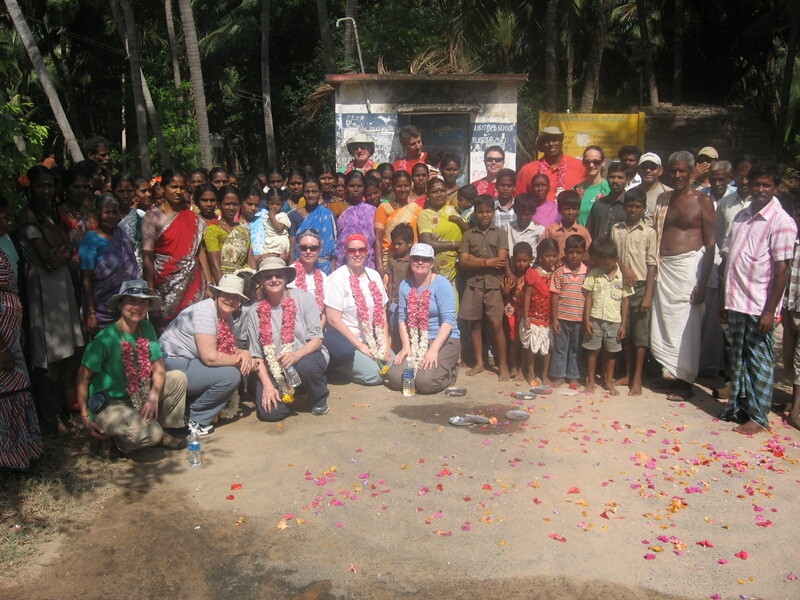 Before we began digging however we were introduced to one of the families who would be receiving the first home. 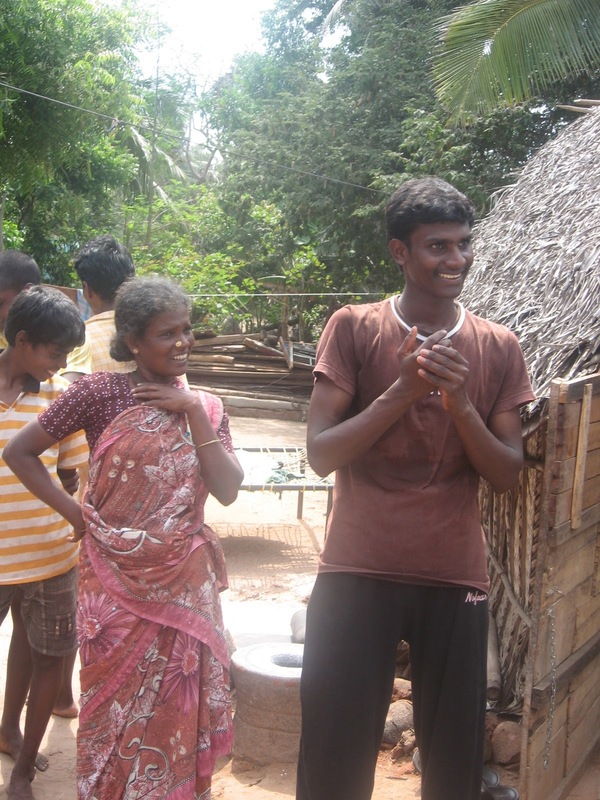 It was a woman who's husband passed away and her two sons lived with her. One son who we met was an electrician and the other son is a mason. They also allowed us to go into their current home...what an eye opener!!! It was about 70 square feet...for three people....had one bulb for electricity, no toilet, a fan that you would hit if you stood up, no running water, a cooking platform, a water container in the corner and a TV...yes you heard me right. Apparently during the last election TV's were given out to people. 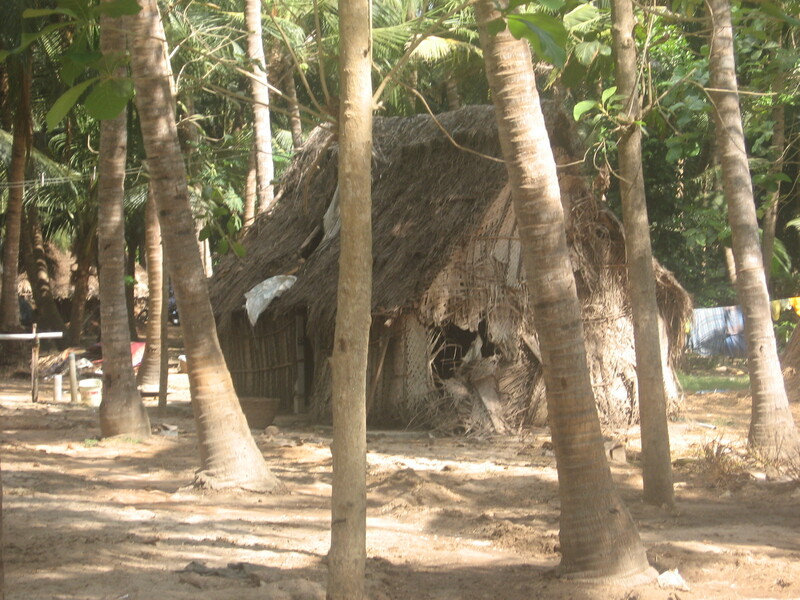 The roof of the house was full of holes....made of palm leaves....and when it rains they must leave the home for better shelter. 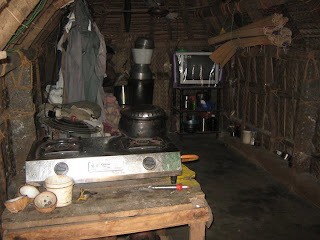 The floor was concrete and they would put mats down at night to create a bed.....UNBELIEVABLE living conditions. They actually told us that the international standard for living space is 45 square feet per person....can you believe that?!?! Habitat uses that as a guide, but makes their homes bigger, so this one with be 325 square feet for three people. From here we were broken into two groups...working on two different homes...and started to dig. 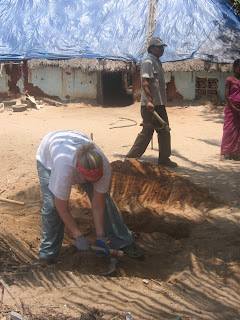 The site was already plotted out, so we were given shovels, spades and some sort of knife to cut branches with. We were also given a crow bar and a few bowls to help excavate the soil when the hole became so deep you could no longer throw out the sand. 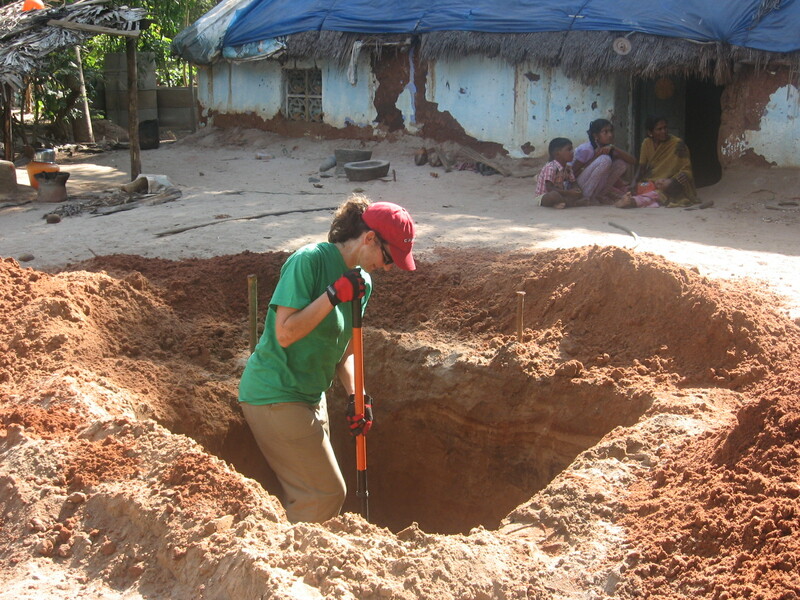 We started digging three different holes. My team was lucky as we had a little bit of shade with some of the holes, but the other team was in full sun the entire day.....VERY HOT!!!!! We dug and dug and dug....and over time we came up with a bit of a system. Two to three people per hole and you needed to trade off on the digging every 5-10 minutes....otherwise you would get too hot and tired...some people became very exhausted and needed to take some time out. It can be very dangerous if you don't stay hydrated and take constant breaks. Everyone was sweating from head to tow and when 1pm came...two hours of digging....we were never so happy. We head to lunch in our tent area...catered by our hotel and very good Indian food. Most of us were so tired we could hardly move...but feeling fantastic at the same time. At 2pm, we were cleaned up, had our suntan lotion back on and headed back to the work site. It was such a feeling of victory when we finally finished our first hole....we would use pieces of stick to determine the length and the depth of the holes. The home owner helped us quite a bit. 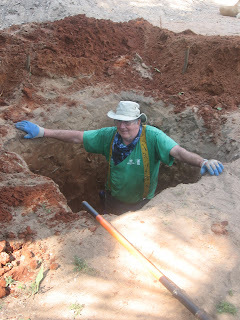 Apparently he digs wells, so he was great at digging. One hole was by a coconut tree that will be cut down, so it was slow going. Another hole was full of red ants....they bite!!! 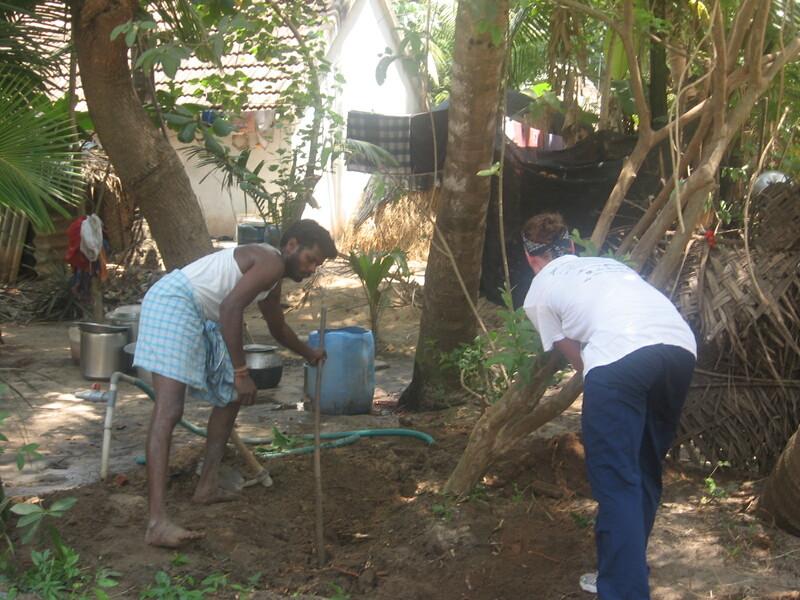 During the first bit of our dig, some sort of discussion started happening between the home owner and some of the villagers. We had no idea what they were saying, but it went on for about an hour and became very heated with more and more people joining the discussion. Turns out there is going to be a second house built right next door and the land we were digging on was once owned by the father of the current homeowner and he gave his son the land. They were discussing where the property lines were and where the second house was going to go. Quite the scene to watch them have this heated discussion....but all was worked out in the end. By 3:45pm we were all exhausted, sweaty and ready to head back. We counted all our tools, took our cameras, work gloves and suntan lotion and headed back to camp. From here we had a quick debrief and jumped back on the bus and head back to the hotel...ecstatic to be part of this great day!!!! Back at the hotel we had the evening free to relax and enjoy our 7:30pm dinner...we eat quite late here as the restaurant doesn't open until that time. Although I should be exhausted after this grueling day, I am completely energized. It's hard to describe how it feels knowing you are making a world of difference for a family by doing what seems to be so little. I can see how this can become highly addictive! !